First cut your plywood to the dimensions listed in the cut list. You can do this with a table saw, circular saw, and jigsaw. Just be sure to use a guide to get a straight cut. 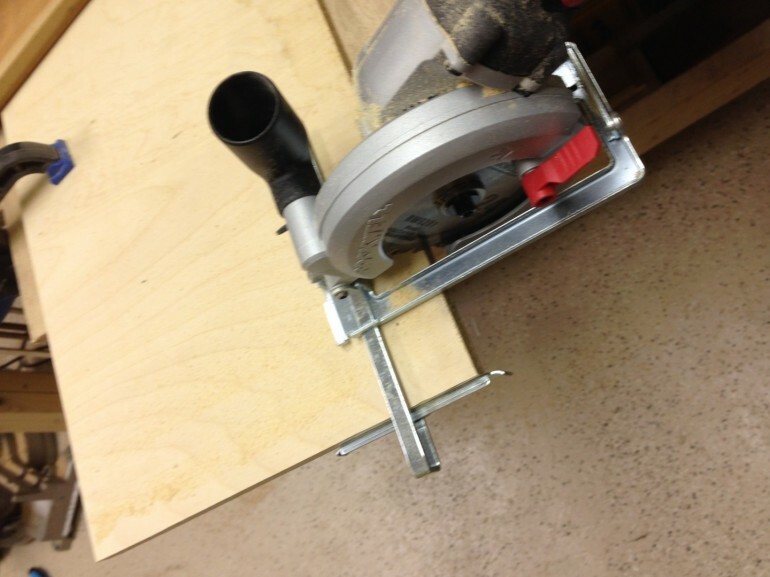 Here, I am using my new compact circular saw. Cut out all 8 pieces you will need for the legs. Once you have the pieces for the legs cut out, we need to screw them together to make the 4 legs. Each 3″ wide piece will be paired with a 2.5″ wide piece. 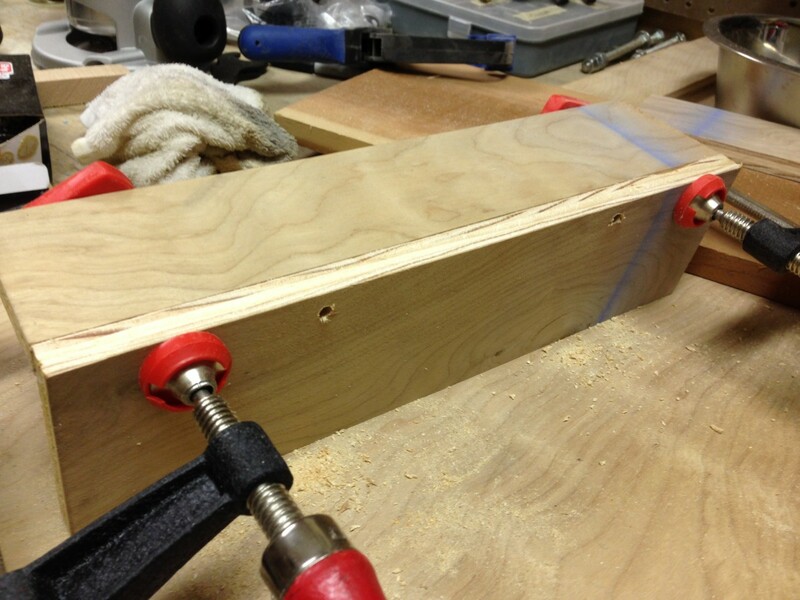 Clamp the 2.5″ piece at a 90 degree angle to the edge of the 3″ piece as shown below. 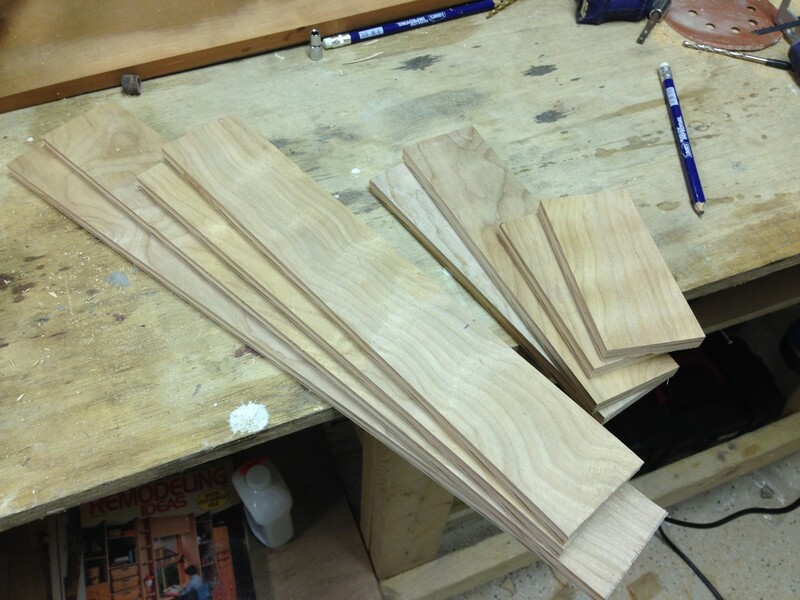 Since the plywood is half an inch thick, this will the legs 3 inches of both sides. 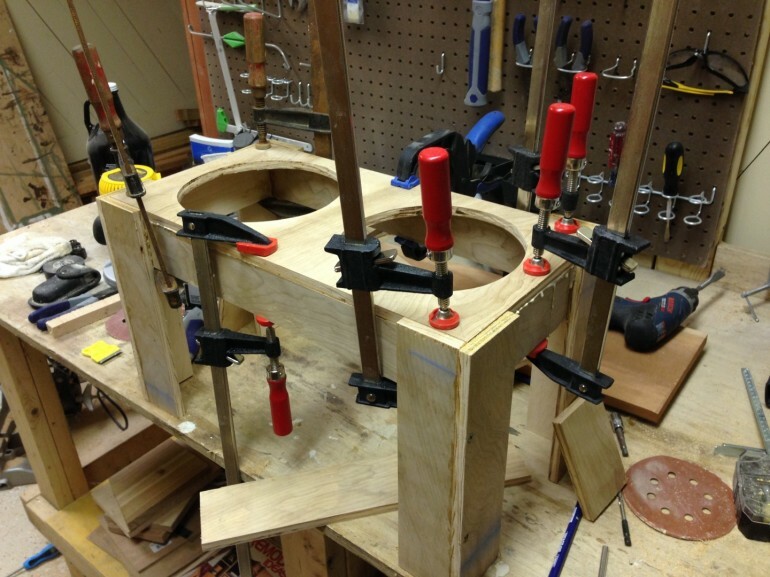 Once clamped, counter sink in several spots on the legs and use some screws to attach the pieces. Now that your legs are complete, we’ll cut our pieces for the inside of the feeder that will connect the legs together. Once you have your pieces cut to length, we will attach them to our legs. We will glue the 20″ pieces on first. Measure half an inch down from the top of two legs and make a mark. As shown below, we want to glue our 20″ piece half an inch down from each leg where our markings are (this will leave room for us to add the top later). Once one side is glued, then repeat the process on the other side with the remaining 20 inch piece and the other two legs. You should now have two sides complete. We need to bring the two sides together to complete the base. This is where you’ll use the 9″ pieces. Glue the 9″ pieces half an inch down on each side just as we did before to bring the sides together and complete the base (Unfortunately I do not have a picture of this step). With your base complete, let’s finish the top. First, cut a piece of plywood to the size listed in the cut list. 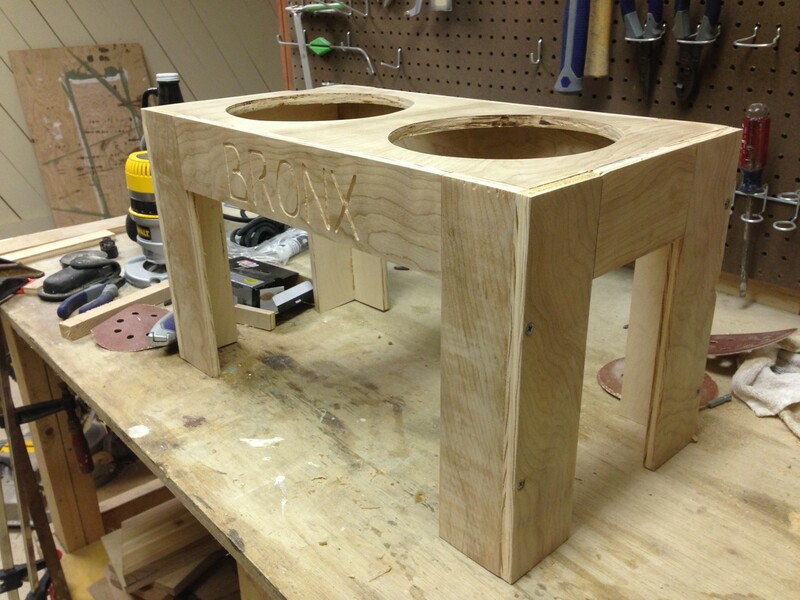 Once our piece is cut out, we’ll need to cut out the holes that will hold the two dog bowls. 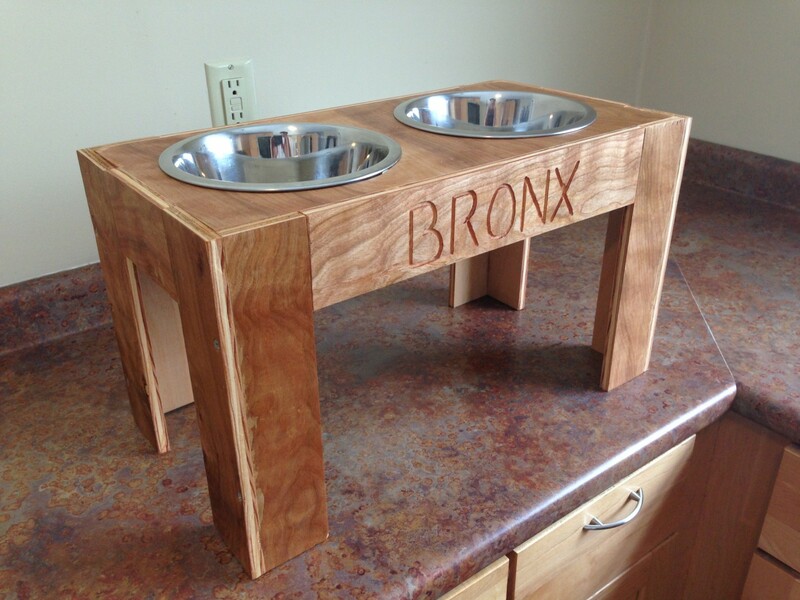 The dog bowls I am using require holes 7.5inches wide; however, you will need to adjust this to match whatever bowls you will be using. 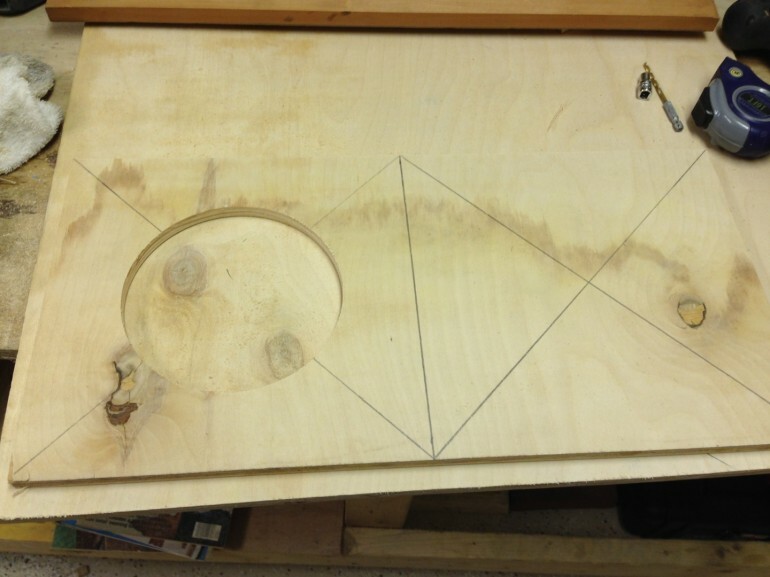 To get the placement for our holes, mark a line directly down the center of the board. 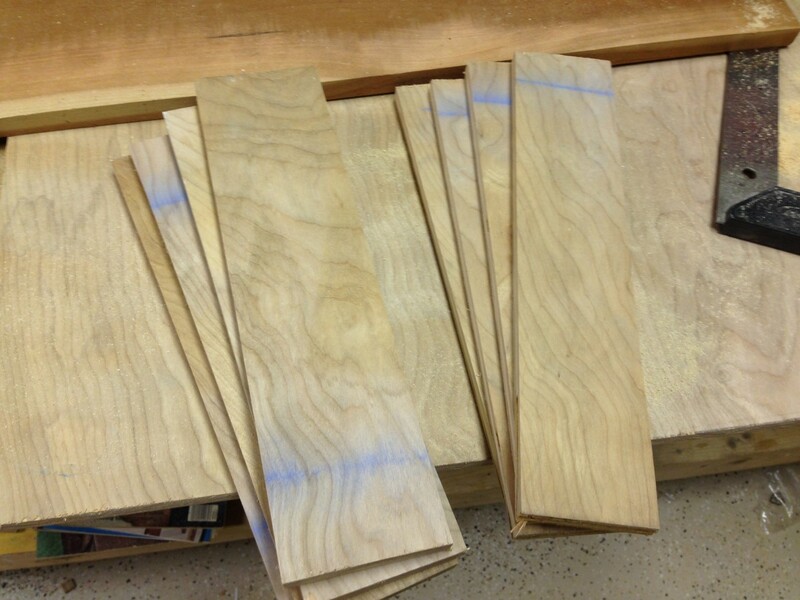 Then use a ruler or straight edge to mark an X onto each half of the board as shown below. The center of this X will be our center point for each bowl. You can then use a compass or some other method to draw your circles around these points. I simply used a nail, a string, and a pencil to draw my circles. Once your circles are drawn, go ahead and use a jigsaw to carefully cut out each hole. With our holes cut out, our top is ready to be attached to the base. This is fairly simple. Remember the half inch we left on the top of our base earlier? If all of our measurements were correct, the top should fall right down into the base where we left that extra room and then be flush with the tops of the legs. 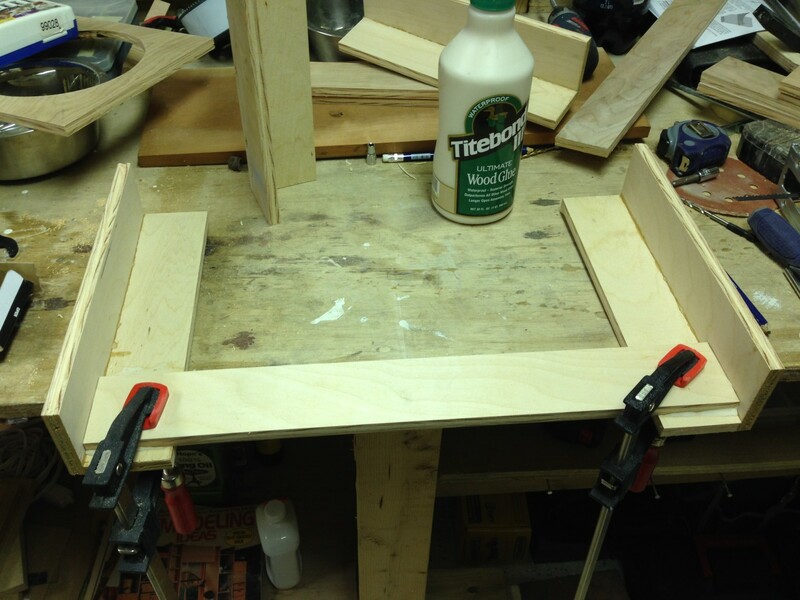 Glue and clamp the top in this position. With the top attached to the base, we are just about finished. All we need to do now is cut out the pieces for the “outside coverings” from our cut list and attach them to the feeder. The 15 inch pieces are glued between the legs in the front and back. The 5 inch pieces are glued between the legs on both sides. Make sure these pieces are nice and flush with the top of your feed before clamping them in. Once these pieces are attached, your feeder should resembler the one below. For an added effect, I carved my dog’s name into the front cover of my feeder before attaching it. Lastly, we’ll want to put a finish of mineral oil onto our feeder. Mineral oil is odorless, flavorless, and will provide the feeder with some water resistance. Application is simple. Just apply it to a cloth and give your feeder a good wipe down. That’s it! We’re all finished up. Hopefully you and your pet will enjoy this mealtime addition.